Yay Halloween is almost here. I wanted to give you a fun craft that me and Sophie did the other day. Remember the Alexander Henry remnant we found at Joann's? Well this is what we did with it. 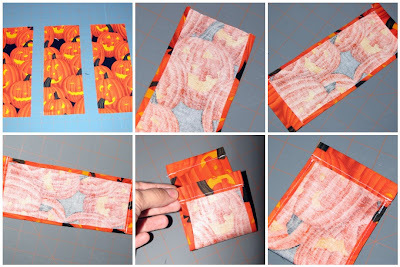 Step 1:: cut out a rectangle from your desired fabric that measures 3.5" x 9.5"
Step 2:: Fold and iron the long edge over about 1/4 inch towards the wrong side of the fabric. Step 3:: Fold and iron the short edge 1/2 inch towards the wrong side of the fabric. 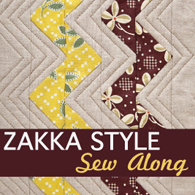 Step 5:: with right sides together, fold the two ends to meet at the short end where you stitched. Step 6:: Sew along the longer edge, stopping where the top stitch begins( see picture) If you sew to far then your opening will close up. Your bag should now look like the first picture shown above. Turn your bag right side out to make it resemble the second picture. Now you have your treat bag. Take a piece of twine or ribbon and use a safely pink at the end to thread it through the top hole on your treat bag. Push the string through one end out the hole and right back into the other side making sure not to cut ribbon thread yet. After you have strung your bag tie a knot at the ends of the ribbon. (we also used a lighter to singe the ends to prevent them from coming unraveled.) Now you and the kiddos can stuff them full of candy! When your done tie up the top and set it in your trick or treat bowl. 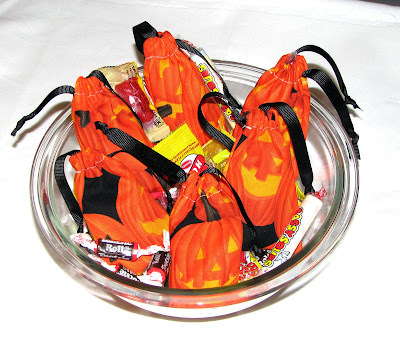 There are many ways to make these bags, this just happens to be our version for the trick or treaters. To adjust the sizes just make your rectangle larger. There is not such thing as a wrong size when making these. Super easy, and fun to. Enjoy! Just exactly where were you when I was Trick or Treating age? LOL I think I would have mugged another kid for these bags! 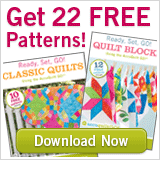 Too cute and I will be using the tutorial for little bags my mom is crocheting...sew I can line them and make sachets! Happy sleep and quilty dreams! these are awesome! I have a preschool halloween party this week adn I might just have to do up some of these for the B's class. Very nice way to give out candy! Unfortunately, I would have to do hundreds of those. I go through about 15 -17 bags of candy in our neighborhood. That would be a lot of fabric! what a fun and creative way to give out candy! These little bags would be great for the children's classmates and teachers too. Thanks for sharing it! All I have to say is, "Trick or Treat"
Those are too darn cute!! Thanks for sharing! These are so cute! Just so you know, I've awarded you a blog award over at http://itisagoodday.blogspot.com/2009/10/my-first-blog-award.html. Thanks for a great blog! I sewed up about 20 of these last night for B's preschool Halloween party. Thank you for such a neat idea! They were super easy and came out so cute! 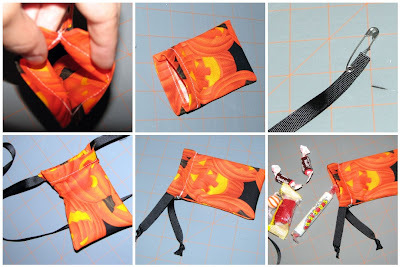 It was a great way to use some of my halloween scraps too!